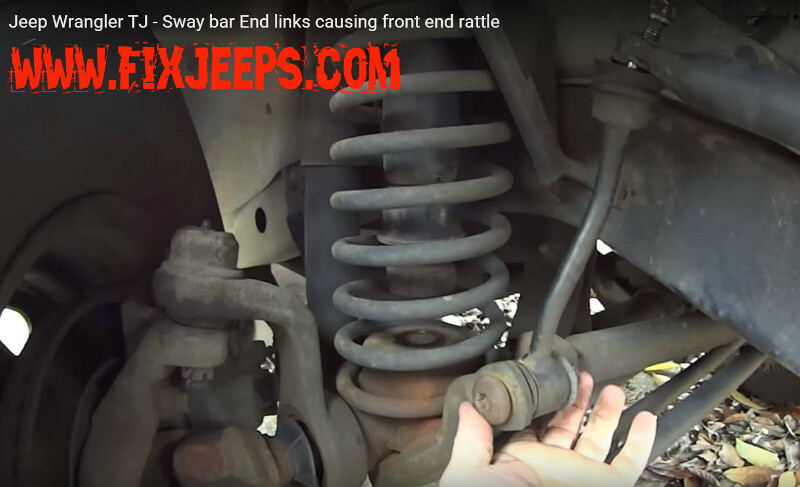 Jeep Wrangler Sway Bar Links - These simple little devices can wear out quickly if you do a lot of off-roading. But in the case with the Jeep in the video below, it simply had over 140,000 miles on the factory links. The sway bar links were simply wore out because he drives the heck out of it. That is why people own a Jeep Wrangler, to drive and enjoy. Often people will just replace the one link that is defective. I really suggest replacing them in pairs. This is because if one is defective, the other isnt far behind. They are inexpensive and easy to change. So go ahead and knock them both off at once while you are at it. Jeep Wrangler Sway Bar Links - This TJ is due for a set! Changing sway bar links is really a simple job. A few common tools is all thats needed. To separate the tapered pivot point of the link from the sway bar you can use a Tie Rod separator fork. Or in my case, I just smacked it a few times with a hammer. First take out the bolt that has the T55 torx and 18mm nut. Remove the 16mm nut from the end of the sway bar. Use the fork or hammer to drive out the pivot end of the sway bar link. Once the old part is out. Install the new ones are pretty much in reverse order. Except for the replacement ones can have a little hex key socket in the end of the tapered part of the pivot. This can assist you in preventing the pivot from turning while you are tightening. See video below. Provided below are a couple of examples of replacement parts for your Wrangler TJ. Please keep in mind that different model TJs can take different parts. So please verify your exact model before ordering if you decide to do so. Here is a link to a set that are factory replacements. These will work fine if you have no lift. Also if you do very light off-roading that doesn't require lots of suspension flex. Just click the image. If you do any off-roading, you may opt to install these instead. These provide room for lift. Bit most importantly that will disconnect for maximum suspension flex. Just click the image.